This was one of my craziest and most fun days in the Philippines. And it is without a double THE MOST delicious snack. We made these golden fried brown sugar sticky bananas called Banana Cue when my friend Angie was visiting Bjork and me in Cebu. I took advantage of having another adult around during the school day and did something that I’ve said I would never do again: cook with my elementary aged students. Think of the hottest you’ve ever felt in your life and multiply it by 348,792. That’s how it feels to stand over a hot pan of frying oil while trying to control a group of kids in a small kitchen in the mountains of the Philippines. bahhhhh. I feel stressed out just thinking about it. It’s a small miracle that my type-A self is able to be a teacher. But seriously, this day was just plain fun. My kids were sososososo so excited to cook together with Auntie Pureza, one of the house moms. Like, the cutest kind of excited where they ask about it every day and suggest that we try cooking lechon baboy (um, a whole roasted pig?) next time. It was such a big deal to them that when Auntie Pureza asked for volunteers to do things like throw the banana peels in the garbage, every hand in the room would be bouncing up in the air. I reallysupermiss those happy, fun-loving kiddos. In addition to all the happy shelter banana cue memories, there was a little banana que stand at the bottom of the dirt road leading up to the shelter. So every day when Bjork would pick me up from school on the motorcycle, we’d go driving by the stand where the woman was frying and selling her banana que on a stick. I love banana que. And now I need to stop talking before I book myself a plane ticket back to the Philippines. 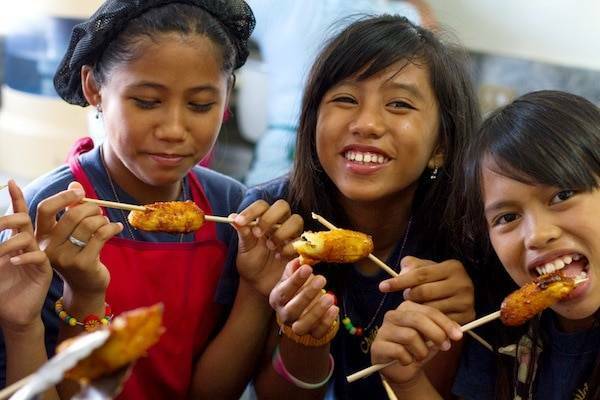 This is a recipe for banana cue from the Filipino orphanage where I worked for a year. Super easy, super yummy, super fun dessert! Heat the oil over medium low heat. Add the brown sugar and wait until the sugar starts to caramelize. Place the bananas in the oil and fry them with the brown sugar so until they are covered with the sticky brown sugar and a deep golden color. Drain on paper towels and serve on individual skewers. I think this would also work with regular American grocery store bananas, although they might be a little more mushy. But who minds a little mush when we’re talking about caramelized bananas!? 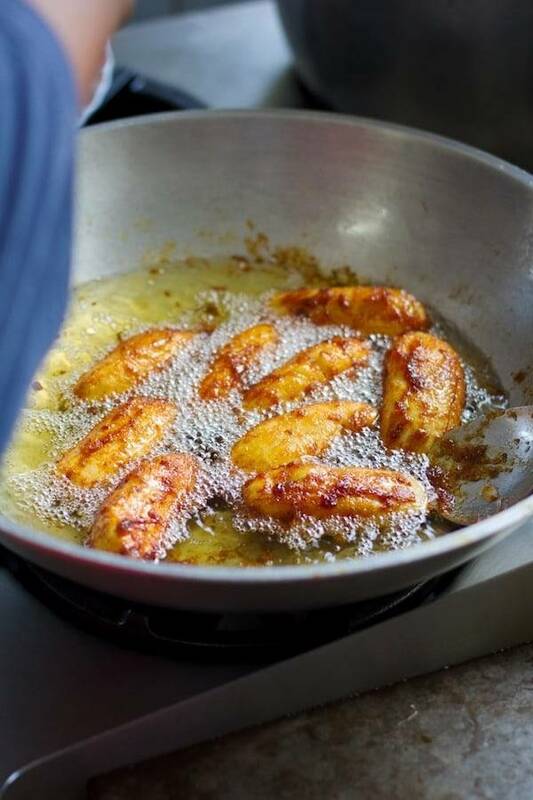 The saba bananas used in the original recipe are really sturdy and hold up well during the frying. 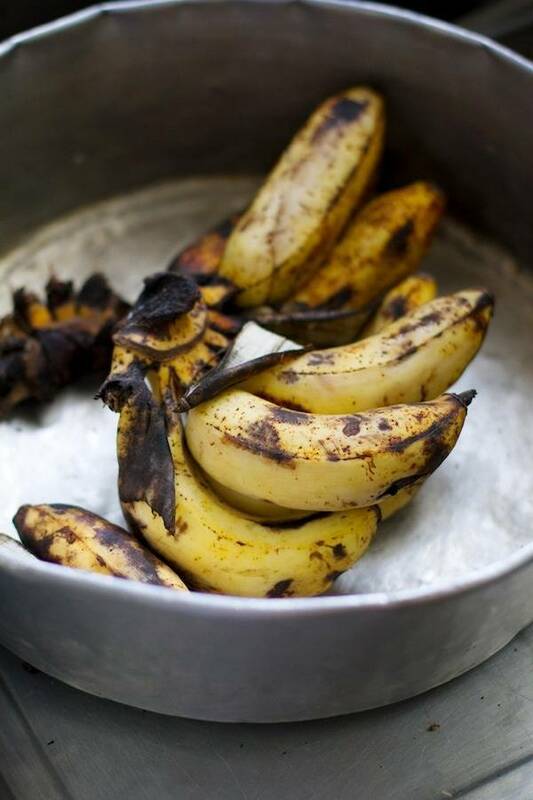 Readers have also suggested plantains as an alternative. Alright, I have something awesome to tell you. This little sweetie-sweet-sweetheart? After 3+ years of waiting, she and her seven siblings have just been matched for adoption. All of them, together. You saved the best for last! 🙂 What heartwarming, miraculous news! What fab news for all the siblings. I am soo touched by that. And love the banana que recipe too. I LOVE the banana Que, but the best part if the post is the very last! Wow, that is incredible!! All 7 of them get to be together and that is the way it should be! This just made the start to my dad so much better! Yes! Banana que is a stupid delicious bite! I love it! Sugar… in oil? I’ve never tried that before but these look amazing!! So easy too! And that’s amazing news about that little girl’s adoption, she’s adorable! Oh my gosh, that last sentence makes me want to cry. That is AMAZING. That is so incredibly awesome for them. Woot, woot! Beautiful post … all around warm fuzzies. These sound delicious, I would have definitely stopped for one at the stand every day. SO happy to hear about the adoption, what wonderful news for the children! Wow these look so so yummy. I love brown sugar and bananas, perfect combo and I think need these now. I just love the fact that abroad, such as the multiple times I’ve been to Thailand, they have so many wonderful varieties of bananas that you just can’t find here in the States! So these are like sugary fried banana deliciousness? Holy crap- I’m booking that trip to the Philippines along with you! Wow that’s amazing news! What a beautiful.sweet girl! Made me smile!! And those banana’s look incredible – I had something like that in mexico – truly amazing! I absolutely love easy recipes like this! Yum!!!! Oh my gosh, I LOVE this post, Lindsay! We are Banana Cue Soul Mates! I LOVE them, too. Not everybody appreciates all that sticky caramel goodness. Kudos to you for trying to make them in the heat. I’ve got to share this post! Haha, I believe it is banana “que,” like barbeque. This looks so so soooo so yummy! Wondering if I could get those saba bananas here in Canada, I should eh! WOW Great photos! This looks yummy. I’ve made Bananas Foster before and this is similar. Thanks for the inspiration! Oh that looks so good! It would probably be heavenly with vanilla ice cream! Plantains are a good substitute for Saba bananas since they are quite sturdy too although Saba bananas do tend to be starchier. I love these recipes from the Philippines! what adorable photos…those smiles…and that last smile…wow! how amazing all seven siblings together…God is good!! thanks for sharing a yummy treat recipe! What wonderful news to know a family has been expanded by eight sweet children! Fried bananas are one of my very favorites. I love that so many other cultures have ways of preparing them, though I would NEVER have dreamt to put sugar directly in the oil! We lived in Mexico one summer and every evening a push-cart would come by selling fried smashed bananas with a sweet cream on top. Each night we’d hear his distinct whistle and go running. What is it about fried bananas??! !